The OC Fair. 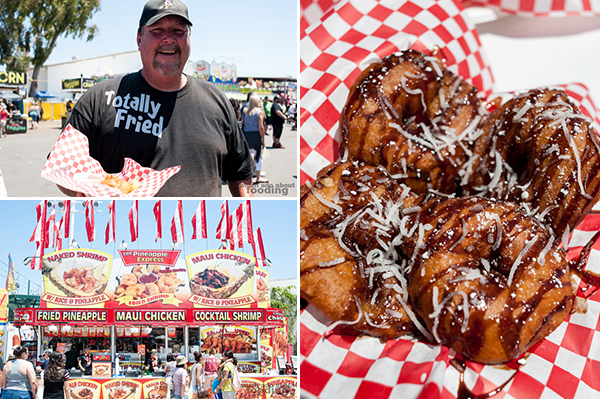 It's a mecca of fried food, summer heat, crazy and bright carnival games, rocking concerts, amazing displays of culinary and craftsy prowess, and so much more. 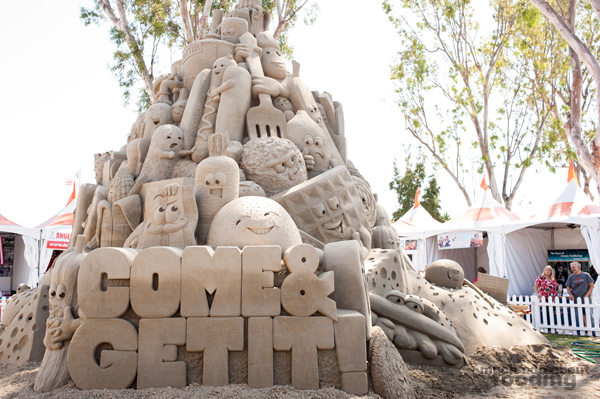 The 2013 one, themed "Come & Get It! ", spanned the OC Fair & Event Center grounds where the fair is always held; attracting OC residents and beyond, it's not a light occasion. We've visited a few times now but for this particular post, it was during a foodie tour that we dove into the popular practice of eating things that have been dipped into hot oil severally. 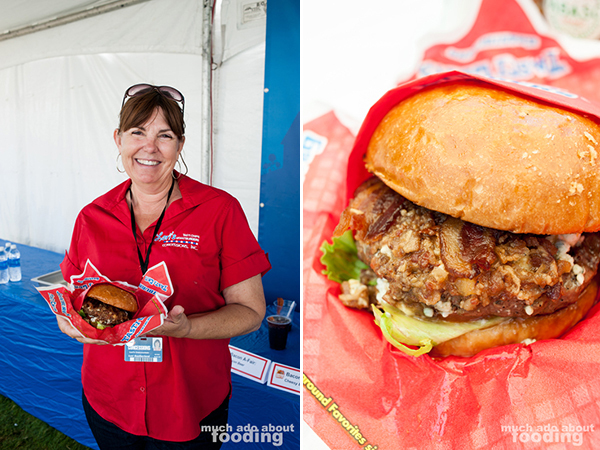 Part of the afternoon involved getting to meet the minds behind the concoctions, and one of those we met was Lori, provider of beloved Tasti Chips and Grantburgers. It seems that just about everyone who has had Tasti Chips love them, and they are saying so with good reason. 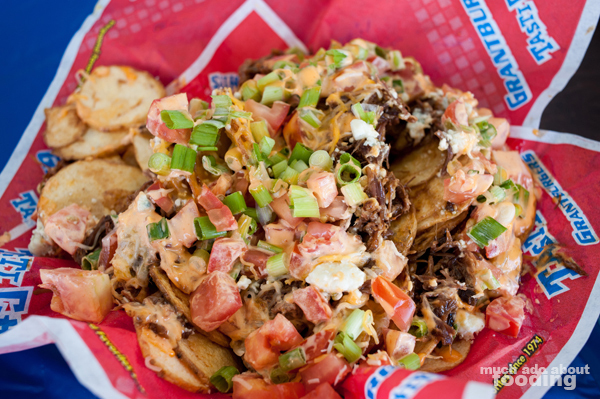 The housemade potato chips are slightly thick to allow for more starchy goodness per bite but still crisp enough to get a satisfying crunch. 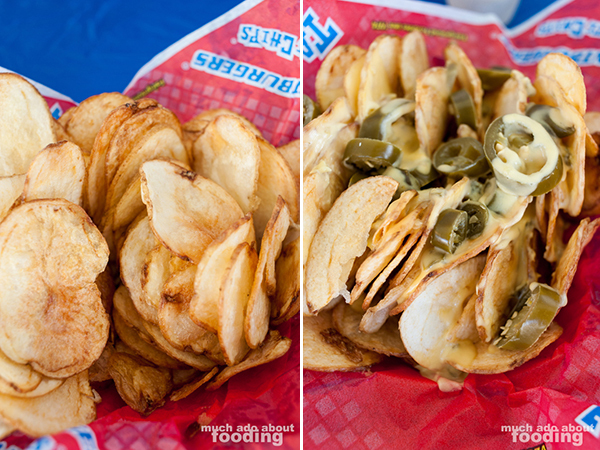 Available were the original, cheese jalapeno chips, and dirty BBQ chips. Condiments included a ghost chili sauce that was mainly mayo with a slight heat to it. We enjoyed the cheese jalapeno ones best though for the combination of gooey, spicy, and crunchy. The Grantburgers were great as well - one being a ghost chili burger with enough heat to leave lips tingling but no tongues panting and the other being a cheese and bacon jam one. 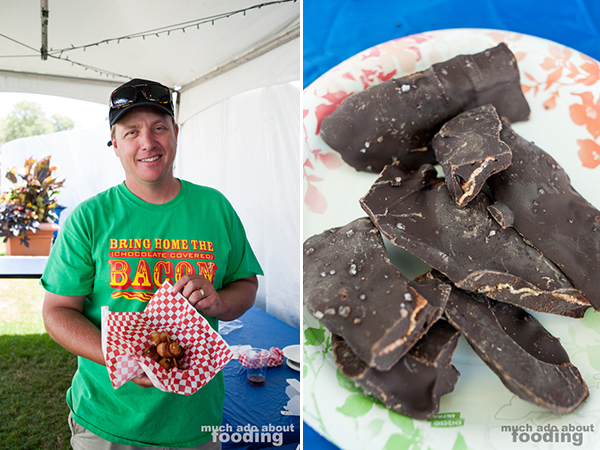 Mike of Bacon A-fair (made famous by their Chocolate Covered Bacon) brought out the porky favorites that people will come to the fair for. 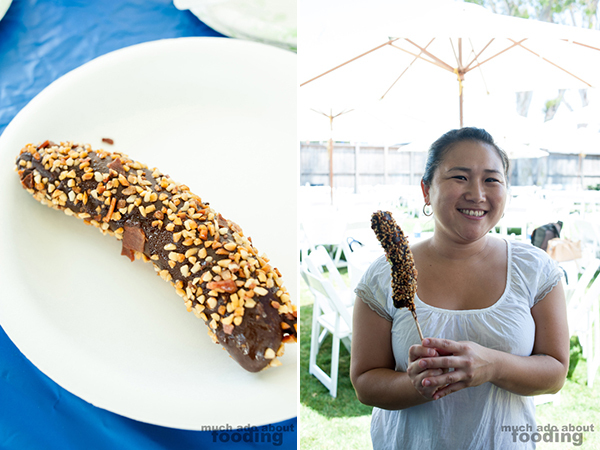 We tried the chocolate covered bacon, and the secret is really in the good chocolate used. This thick dark chocolate hid the bacon well enough that the crisp slice was only a salty flavoring; the star was the chocolate itself. 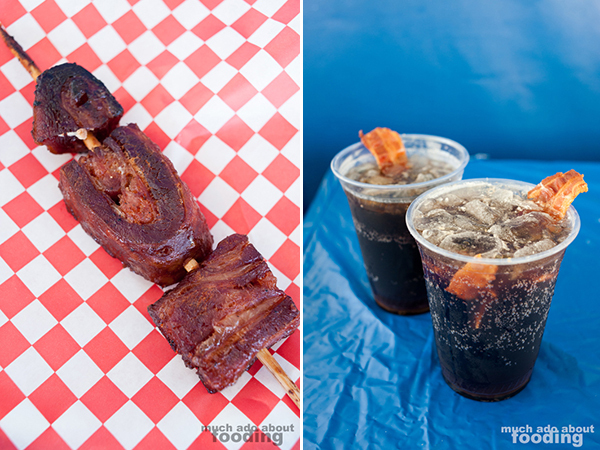 Of course that doesn't stop Bacon A-fair from making Cheesy Bacon Bombs (exactly as awesome as they sound), Wild Boar on a Stick (chewy and lean but flavorful), Bacon Beer (root beer flavored with a Torani bacon syrup - oddly tasty), and a Bacon Chocolate Dipped Banana (bacon pieces all around for a salty crunch). These dishes were nothing to shy away from even for the non-bacon lover. 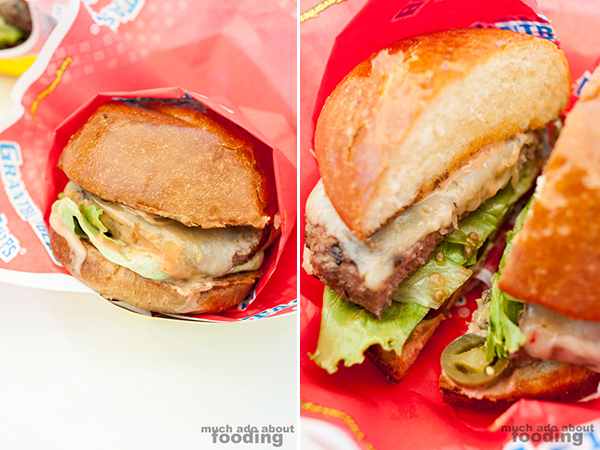 Chicken Charlie's has struck me as the indulgent one of the whole OC Fair bunch. You can pretty much guess so whenever you walk in and see the enormous stands with fried everything, marked by their billowing bacon strip flags. 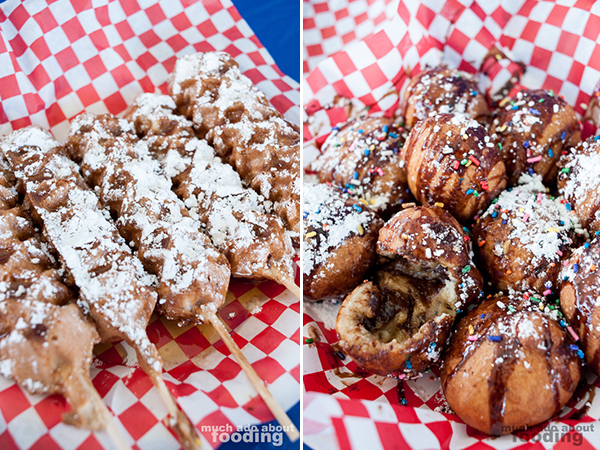 While under the shade of an eating area set aside for the tasters, we had their Waffle Dog (a sweet batter waffle surrounding a hot dog and covered in powdered sugar - an okay corndog spin) and Deep-fried Cookie Dough (something a bit too sweet for both of us). Then we migrated onto the grounds for their Deep-fried Avocado (the "healthier" version of eating fried butter because of nature's butter!) and toward their Pineapple Express booth. Yes, they've got another one where you can find some Deep-fried Pineapple rings to sate any doughnut cravings. 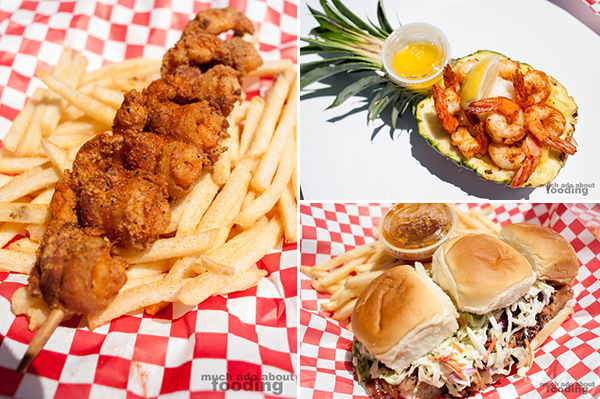 Over at Pineapple Express, we tasted just about everything popular on the menu. 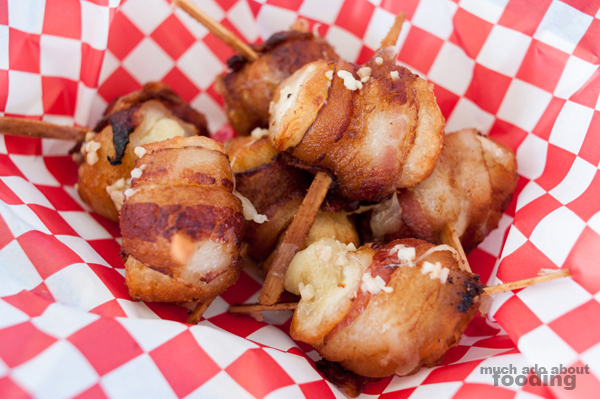 Our favorite were the Bacon-Wrapped Shrimp, a welcome surprise but because of its inherent crunchiness from the shrimp shell and the crisp on a bacon strip (and saltiness! ), it was a treat. There was also their Shrimp in a Pineapple which was smaller than the former dish but packed with both sweet sticky rice and chunks of juicy, sweet pineapple. Then there were also the Maui Sliders, an arrangement of Maui-style chicken with housemade secret slaw between King's Hawaiian rolls. No wonder that's a very popular seller! 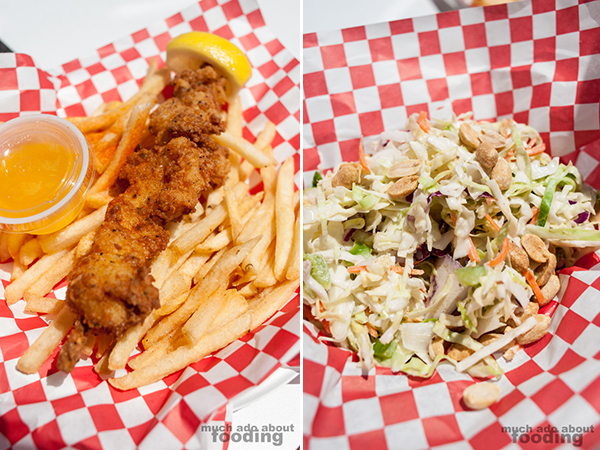 We also had their Fried Lobster on a stick and a whole order of their Slaw, a proprietary recipe of creamy homestyle goodness. Our thanks to everyone who hosted us and allowed us to try out their foods. 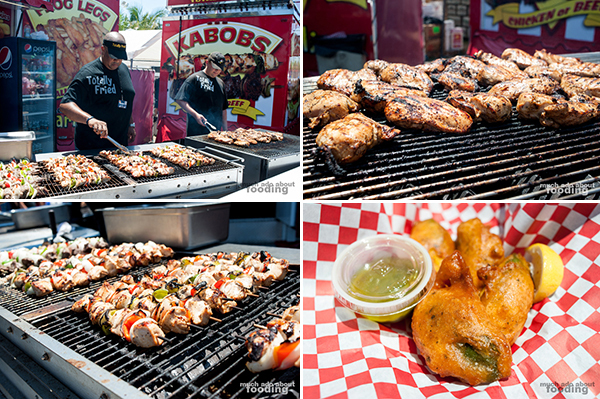 The vendors really do make a difference on the fair because they are who people will come out of their way to see and eat from! Not to take away from the food but I also wanted to say thank you to everyone for your continued support of Much Ado About Fooding! 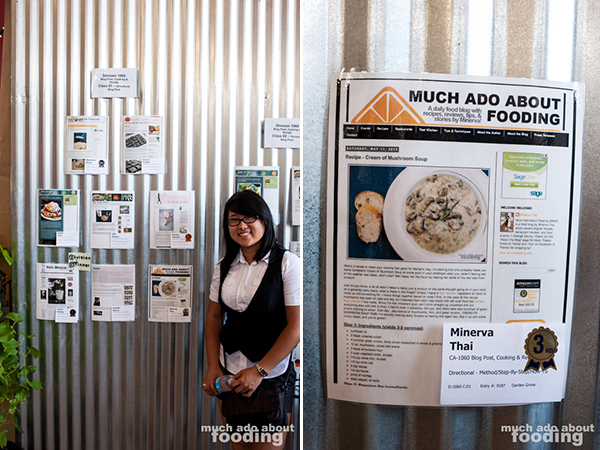 We won 3rd place for Step-by-Step Recipe for the Cream of Mushroom Soup recipe! It was great to see that little sticker and to collect the ribbon at the end. It was our first time entering so it was a great honor to receive an award. Congrats also to the other bloggers who placed in their divisions/classes/categories. I'm definitely going to amp up for next year and try to take home that BIG ribbon! Photography by Duc Duong whose bacon obsession I've cured him of. More photos available on Facebook here.